This is a 6" x 6" Marine Protractor with Stencils for Stability and Compass problems. It's keel and centre line make for easy allignment on paper. This 360° protractor has both metric and imperial scales. It is a useful Tool for aiding in the workings of Ship Construction, Stability and Cargo problems. The Straight Pattern dividers are made with brass arms and polished stainless steel tips. Adjustable tension and hand-sharpened points. This sturdy acrylic parallel ruler is easy to use and is a necessary tool for every seagoing navigator. The 18” Aluminum Arm Parallel Ruler features aluminum arms and handles. The aluminum parallel ruler is manufactured to a 1/4" thickness and 18” length. The high-quality construction of the aluminum parallel ruler is backed with a lifetime warranty. The 24 Inch Parallel Rule is primarily used for commercial purposes due to its extra long 24 inch acrylic construction, rigid chrome arms and handles. Parallel rulers are used to plot direction on nautical charts. Two straightedges are hinged so that they maintain the same angle. By alternating the moving edge, and securely holding down the nonmoving edge, you can move the rulers about the chart while still maintaining the same angle. Heavy-duty, flexible crym protractor. The arms of the three arm protractor are rigid enough to trace a bearing line. The Three Arm Protractor can be used to position and chart from three identifiable shore, landmark or buoy locations. Simply measure the angles on the protractor and locate your position on the chart. One of our best selling navigation instruments, the Protractor Triangle with Handle is inscribed with contrast enhancing colors making it easier to use. 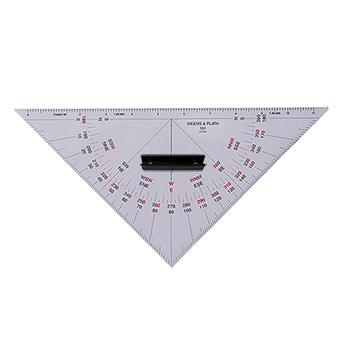 Utilizing two 45° triangles, the protractor triangle with handle provides a straightforward method of plotting and performing chart work. With its protractor scales, this protector triangle's handle is easily aligned in any direction with a chart meridian. Direction is maintained as one triangle is slid along the other to the desired position. The protractor triangle with handle is crafted of durable and clear vinylite. This GPS parallel rule, in a compact size, is particularly suited for use on modern small chart tables. The primary purpose of the Paralock Plotter is to enable the transfer of GPS positions rapidly, easily and accurately to and from any paper chart. The Paralock Plotter features three unique design concepts: a locking knob that allows the user to quickly plot a GPS position on paper charts, two sets of finger holes that enable finger tips to act as friction pads on the underlying chart, and, although shorter than standard size rules, the Paralock Plotter opens to the same width as conventional rules and therefore covers the same chart area. The most inventive feature of this patented device is the locking knob located at one of the four pivot points of the parallel plotter's cross-arms. This knob enables the two rulers to be fixed in any given separation which allows rapid determination of GPS position. The Paralock Plotter is only 7.25 inches long as opposed to the standard rule length of 15 inches, but its opening width is the same as standard rules. Placing finger tips in the twin finger holes allows easy operation of the rule and readily informs the operator if a slip has accidentally occurred while aboard a rolling or pitching vessel. The Paralock Plotter is made of sturdy, clear acrylic for maximum chart visibility. It has graduations so it can be used as a protractor to determine compass bearing. It also has a ruler across the bottom, making it is easy to take distances and transfer them to a mileage scale. The Paralock Plotter has all the features of a standard parallel rule but fits in a pocket and is easier to use. It is perfect for any boater who keeps track of latitude and longitude coordinates on a paper chart. Its compact, convenient size makes it the right tool for use on boats with limited chart space.